This is our full-bodied blend of Cabernet Sauvignon, Merlot, and Cabernet Franc. Deep ruby in color and rich in flavor, this elegant wine provides flavors such as blackberry,cassis and blueberry with some smokey and savory overtones. Enjoy this wine with heavier dishes such as beef, leg of lamb, and braised veal shank. 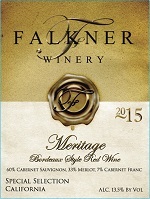 Copyright © FALKNER WINERY. All rights reserved Design & Hosting by Ballantyne Designs.